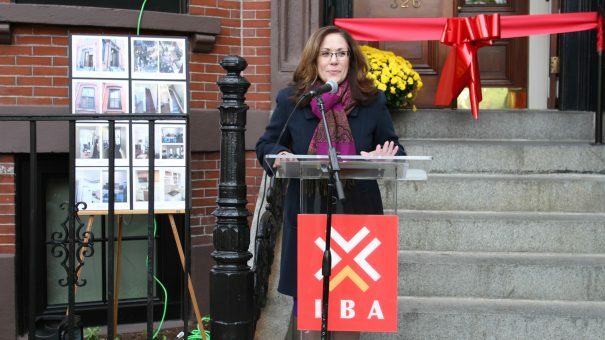 On October 27th, IBA hosted a ribbon cutting (pictured above) and tour of the newly renovated Residencia Betances facility at 326 Shawmut Avenue. The ceremony was led by IBA CEO Vanessa Calderón-Rosado, and brought together city and state officials including State Representative Aaron Michlewitz, Undersecretary of Housing and Community Development Chrystal Kornegay, Advisor to the Mayor for the Initiative to End Chronic Homelessness Laila Bernstein, and CEDAC Director of Housing Development Sara Barcan. There were also IBA supporters and community members in attendance, including the residents of the building who were excited to cut the ribbon marking the official completion of renovations to their home. Started in 1993, Residencia Betances is an 11 room, single-occupancy development located on Shawmut Ave in the South End, serving Spanish-speaking residents who are formerly homeless clients of the Department of Mental Health. Funding for the project was provided through the Department of Housing and Community Development (DHCD) and the Community Economic Development Assistance Corporation (CEDAC).